Last night, Yardsale was boasting about sleeping in this morning since he only had to do 8 miles today. Since I was doing the same Mt. Whitney set-up as him, I decided that I should also enjoy a morning of sleeping in! How wonderful! I pulled my sleeping bag liner over my head and didn’t emerge from my sleeping bag until after 8. By then, everyone else was gone, except for Delaware Dave, who I was camped next to, and who was now facing me, with a book in his hand. That did not make me feel comfortable at all, as I hate being looked at in the morning! (Why, of all the people in the area, did he have to be the one in no rush to get going, and why did he have to be looking right at me?) I walked over to the bear box to retrieve my canister, and then set about my morning routine. Delaware Dave sipped his coffee, gazed at the creek, and read a few more pages of his book. 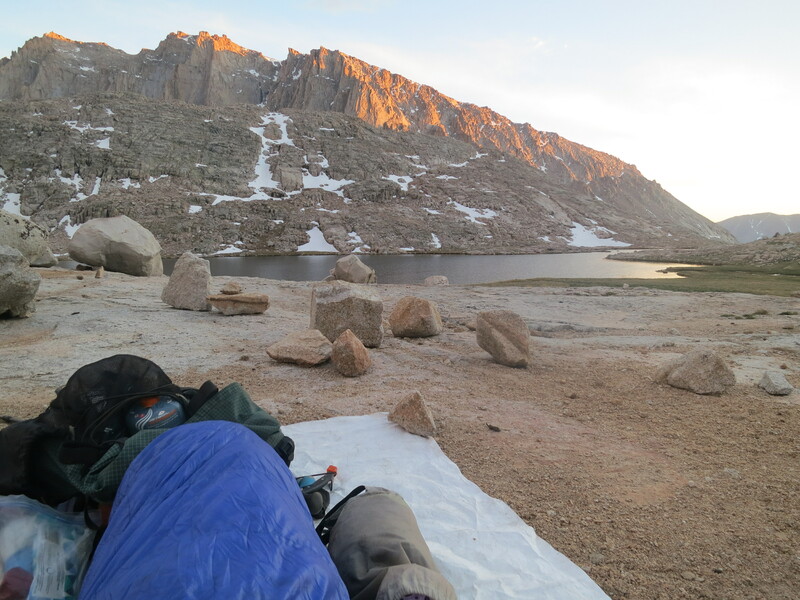 I had never had a morning like that on any of my thru-hikes! 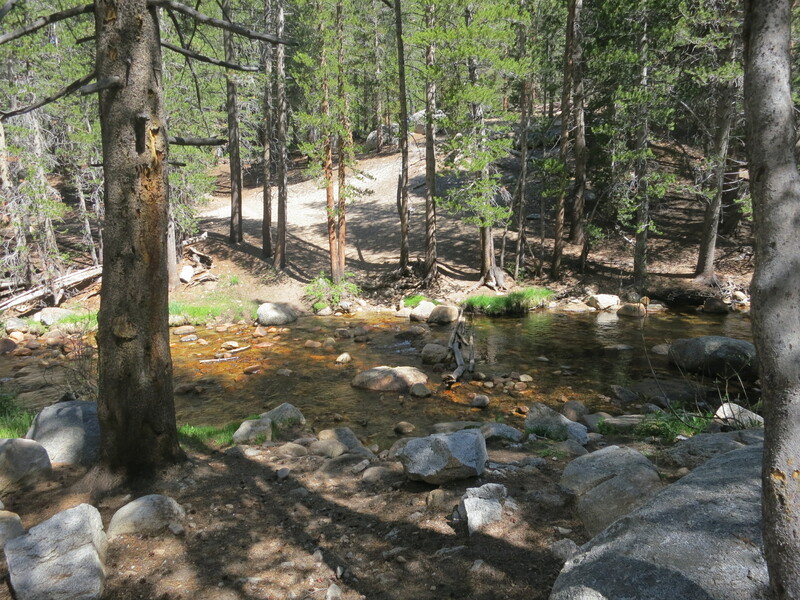 I went down to the creek to collect more water for the day and then went off to find a place to go to the bathroom. 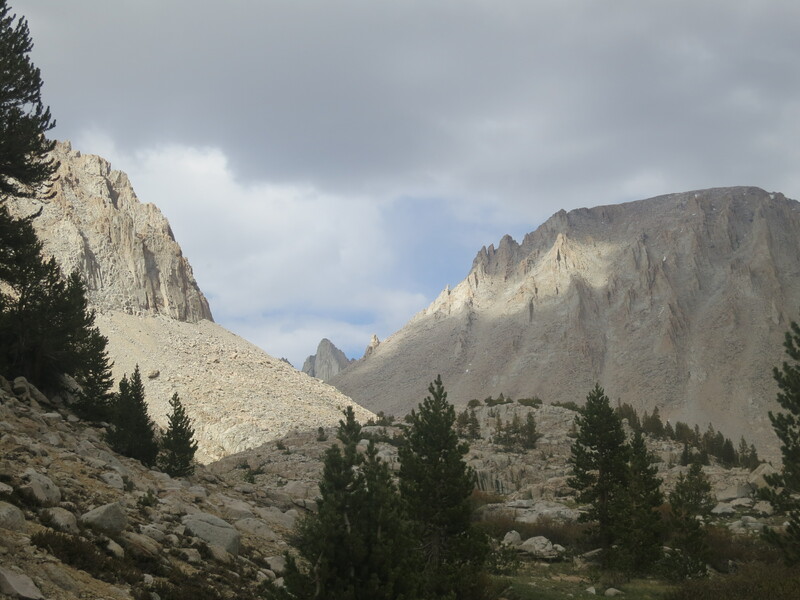 By the time I was on the trail, it was already 10am! Wow! 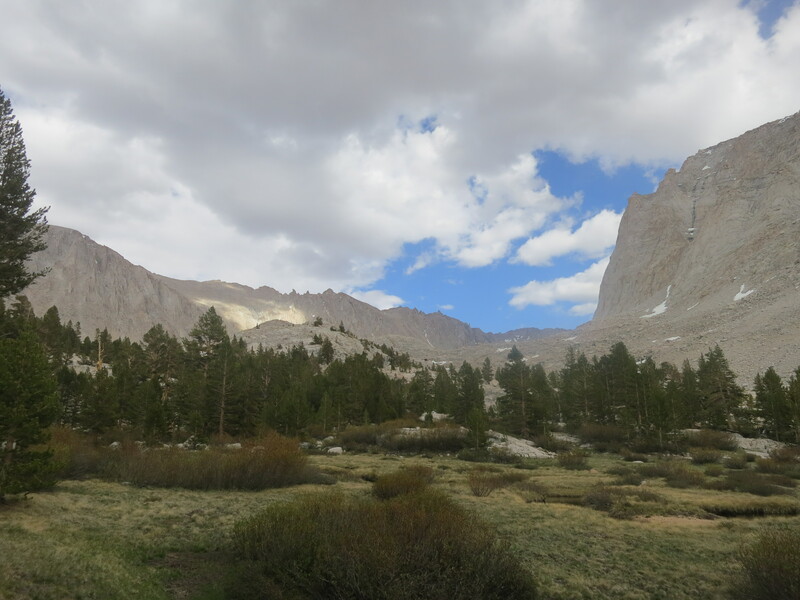 I walked alone for the next six miles, beginning with a good climb out of the creek and then reaching a landscape that combined desert and granite mountains. 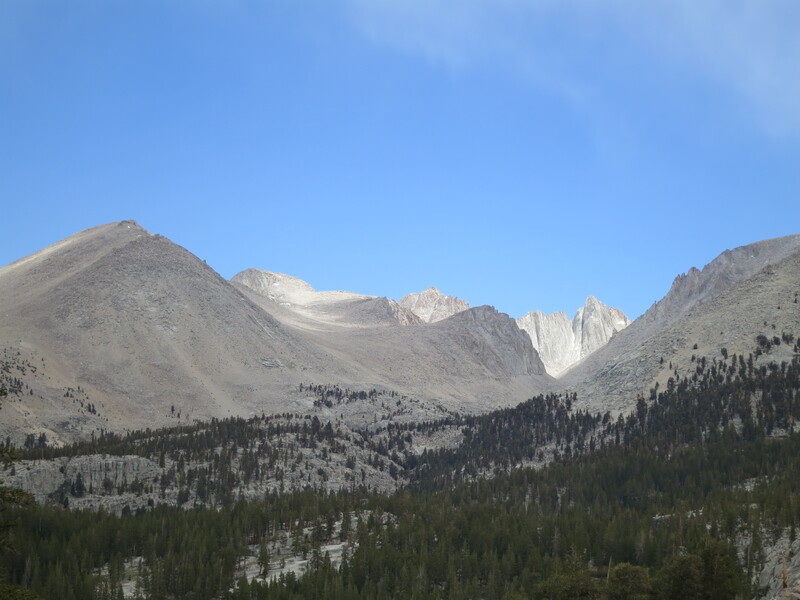 I wondered which mountain was Whitney and every time I saw one with snow on it, guessed that was the one. 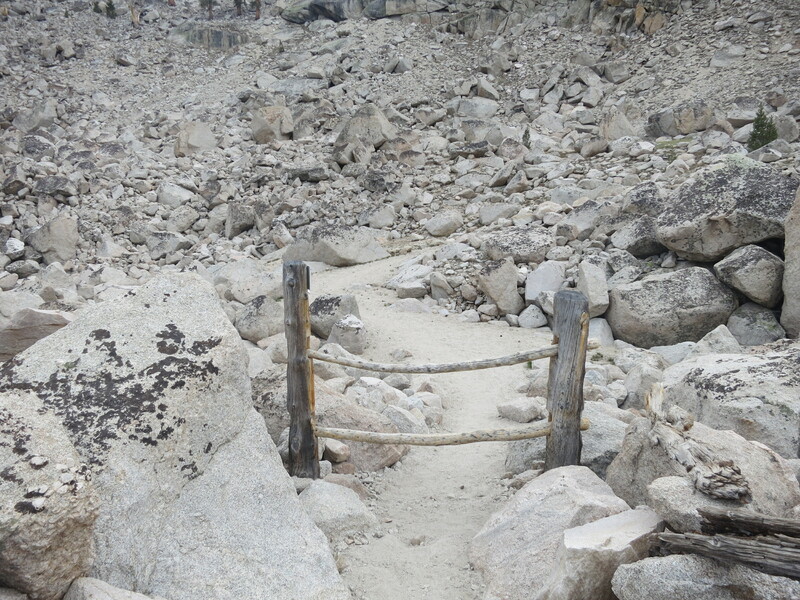 I descended a rock and gravelly path and came to a new kind of gate where I had to slide a wooden pole out of the way. Someone had left a note there for a hiker, but it was not for me. 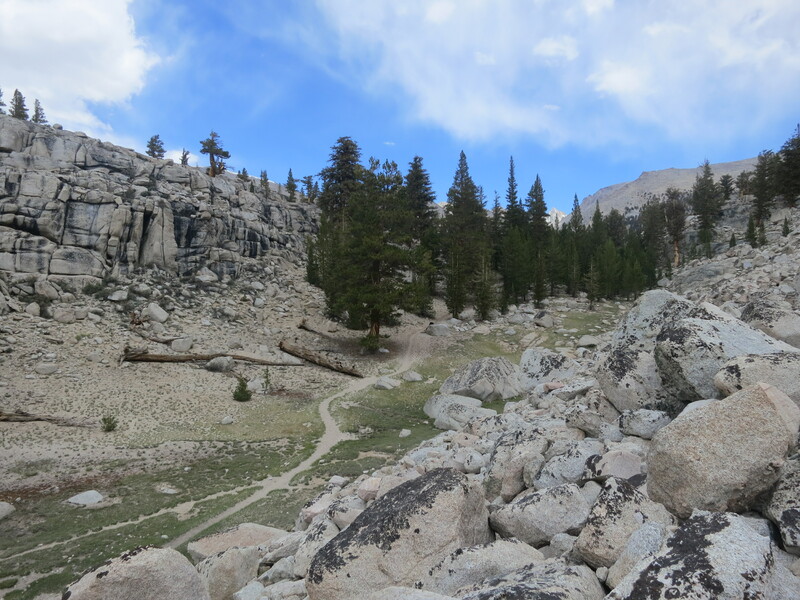 I made my way to a large creek where I carefully had to step on rocks to get across. Delaware Dave was relaxing down the way a bit, enjoying his book again. I waved and he asked me for a favor. Yardsale had dropped his bandana and he wanted to know if I could get it back to him. I had to find a way to get close enough to him so that he could throw it to me across the water. I asked him about the book he was reading and found out that the guy who was leaving the Splinter’s cabin area as I was headed in, had written it about his hike through the Oregon section of the PCT! Delaware Dave had found it in the hiker box at Kennedy Meadows. I told him that I had better start the path towards Whitney. He told me that no matter how awesome it was, to please tell him the next time I saw him that it was just okay, so he didn’t feel bad that he didn’t climb it! I came to the intersection sign at which the PCT split from the Mt. Whitney path and saw a note that Yardsale had left for Hooligan. Someone had written on it, “The PCT misses you, Yardsale!”. 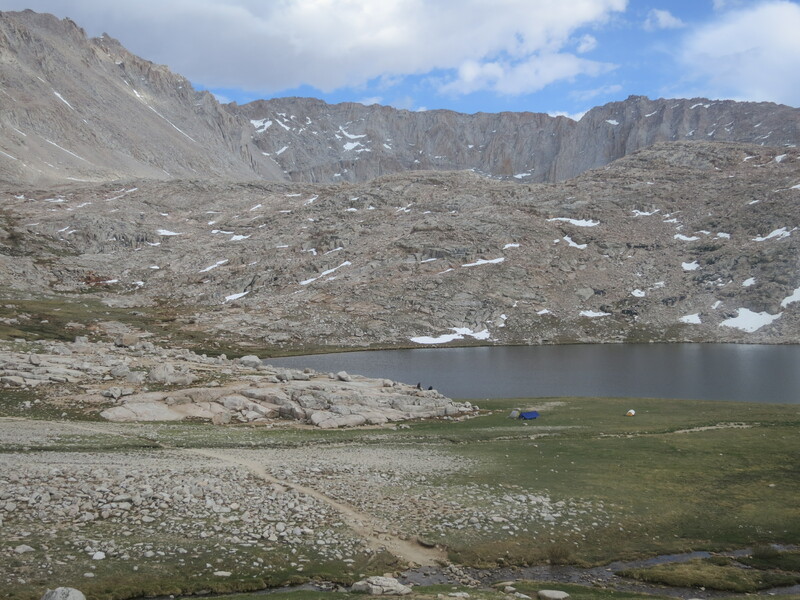 I walked past two tents and then started a gentle climb. I was having chafing pain again, so I stopped to apply my ointment, and then continued up. As I crossed a stream, rain drops began to fall. 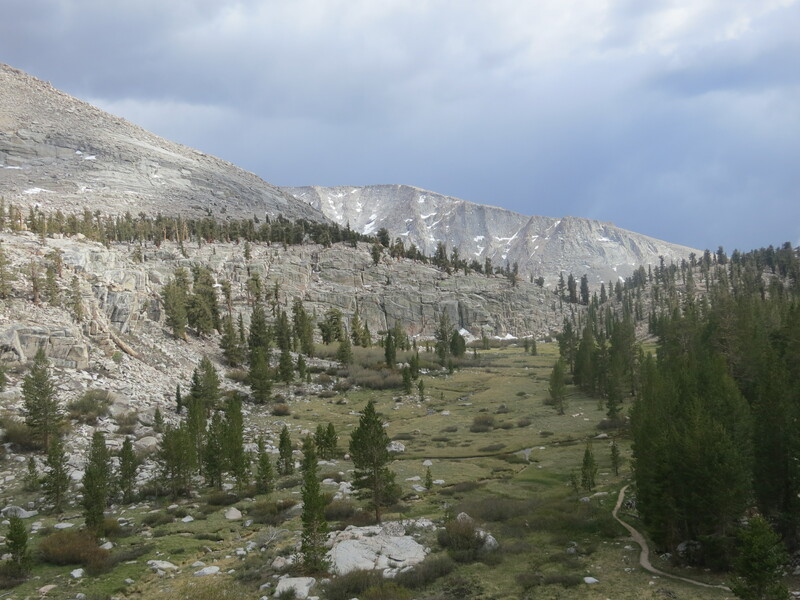 I pulled my rain jacket out of my pack and continued the climb as the rain came down harder. I decided to sit under a tree and wait for a bit. I had two choices of where I could camp for the night. 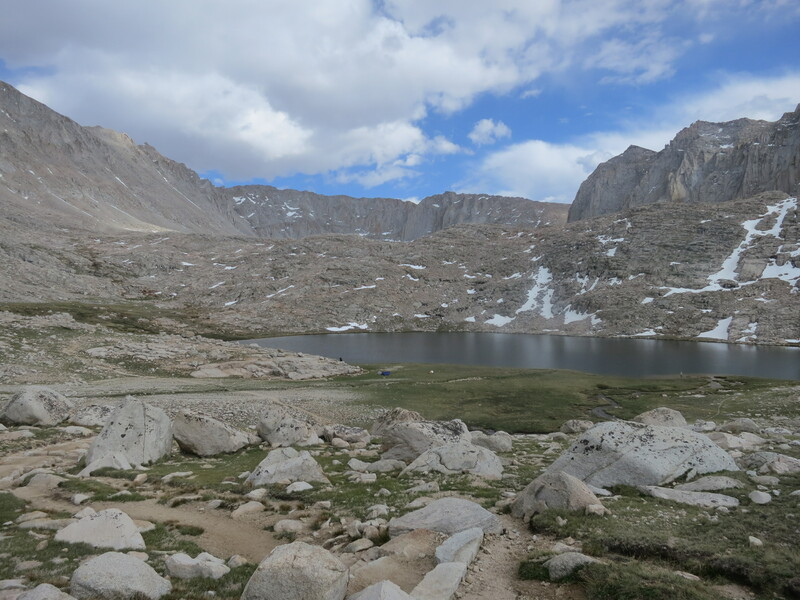 I could stay at Crabtree Meadows, where there was a bearbox that I could store most of my gear in while I made the seven mile climb to the summit, or I could continue on for 2.7 more miles tonight and sleep at Guitar Lake (a very cold, exposed place), and then carry my full pack the rest of the way to the summit. I liked the idea of carrying less weight, but I also liked the idea of having fewer miles to hike in the dark and not needing to get up as early as if I stayed at Crabtree meadows. 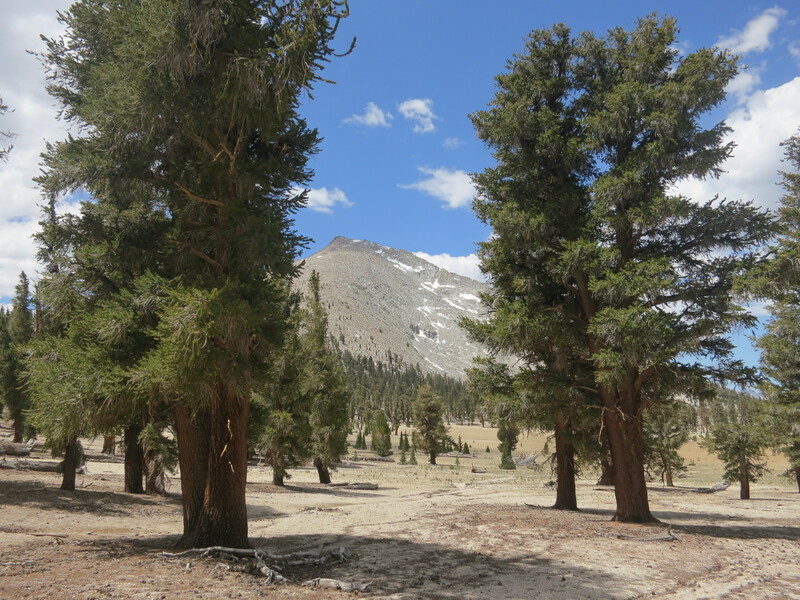 A male hiker came down the path and said hello as I was sitting under the tree, shivering. The rain was making him want to hurry back to his tent. I asked him if he had seen Yardsale, and he told me that he had just left Crabtree Meadows. 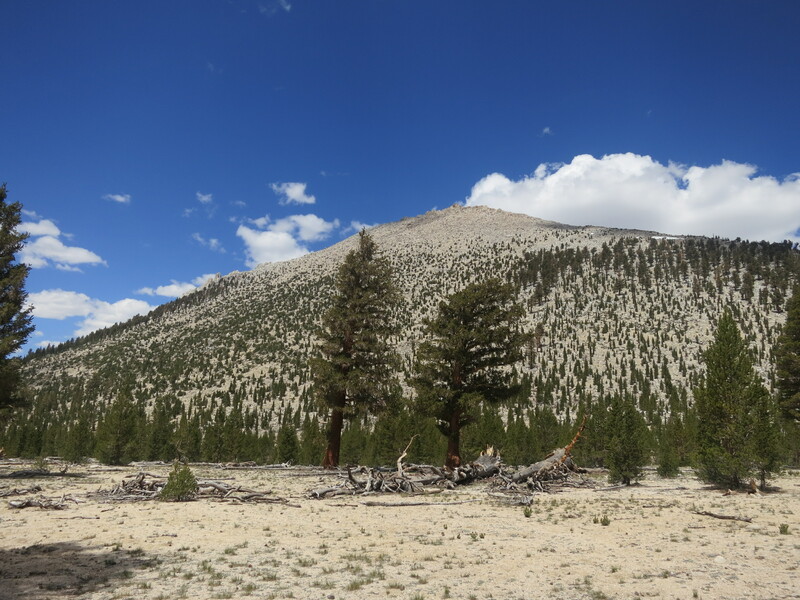 He advised me to spend the night there as there were a lot of trees that would help with protection from the storm. 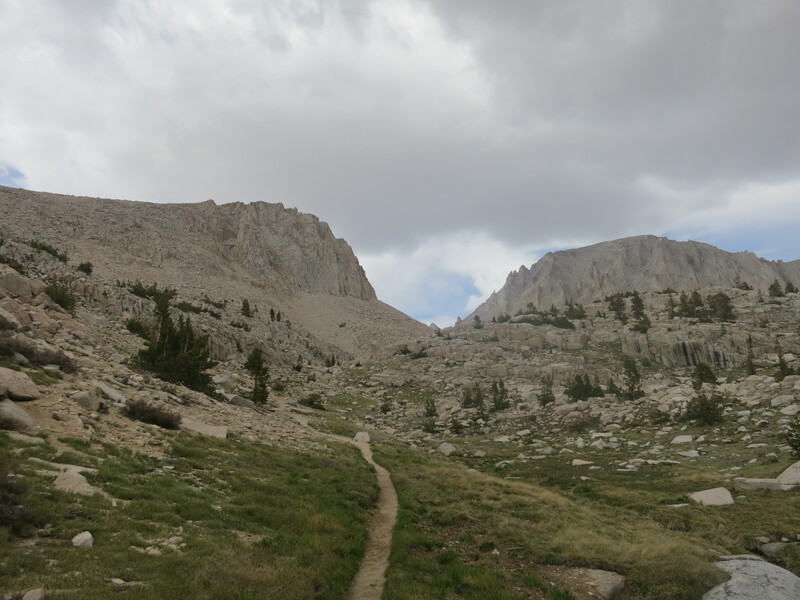 As the rain let up, I continued the climb and reached the meadows. I found a camping spot in between some trees and thought about what I should do. The rain came to a stop and I decided that I might as well move on. I pulled the bear canister from my pack, sorted through my food, and put some of the extra into the can, along with a few other items that I knew I wouldn’t need for the next 24 hours. 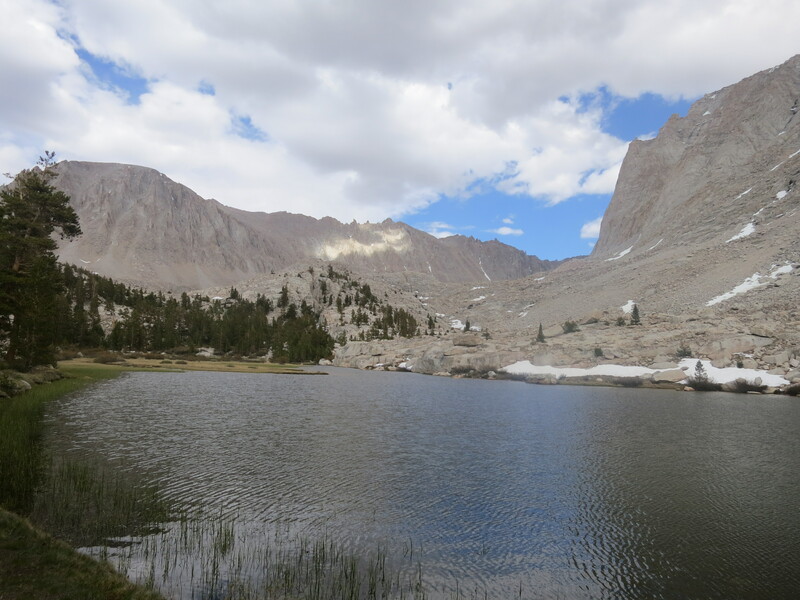 I stashed the can in the bear box and headed across the creek and up toward Guitar Lake. Walking Home was returning from his descent and seemed very happy. 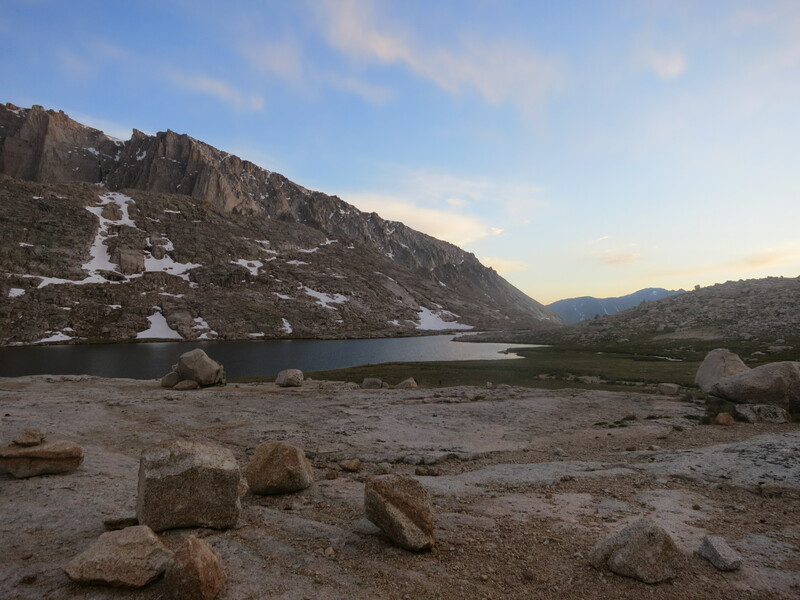 He told me that he was looking forward to fishing at the creek where his tent was set up when he got back, and that there were a couple of guys fishing at Guitar Lake who would probably love to share their food with me. I continued the climb with my stomach in pain again. The scenery was becoming more beautiful, however. I stopped to take photographs of the little magenta flowers, the lakes, and the looming mountains. This day was not turning out to be as easy as I had hoped! 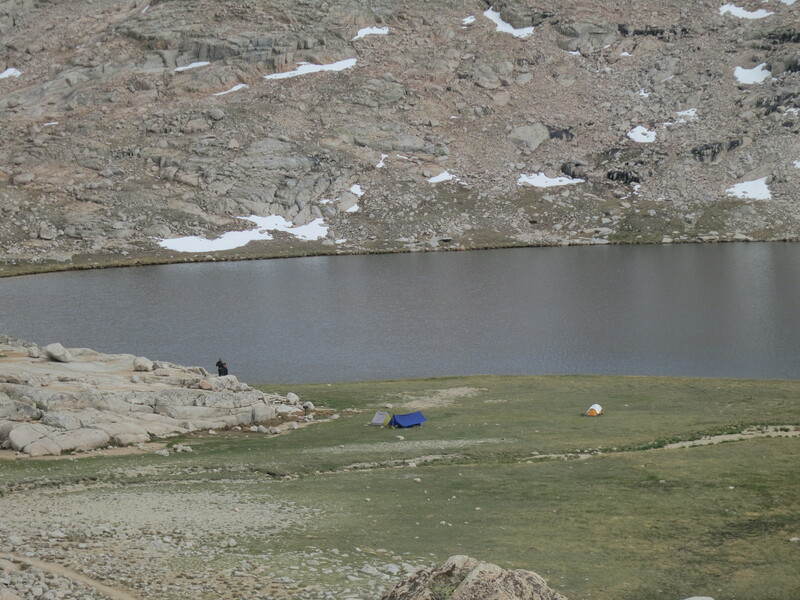 As I drew closer to the lake, I could see a couple of tiny tents set up, as well as a couple of tiny figures, all dwarfed by the huge mountains surrounding them. It was the most beautiful sight I had seen so far. 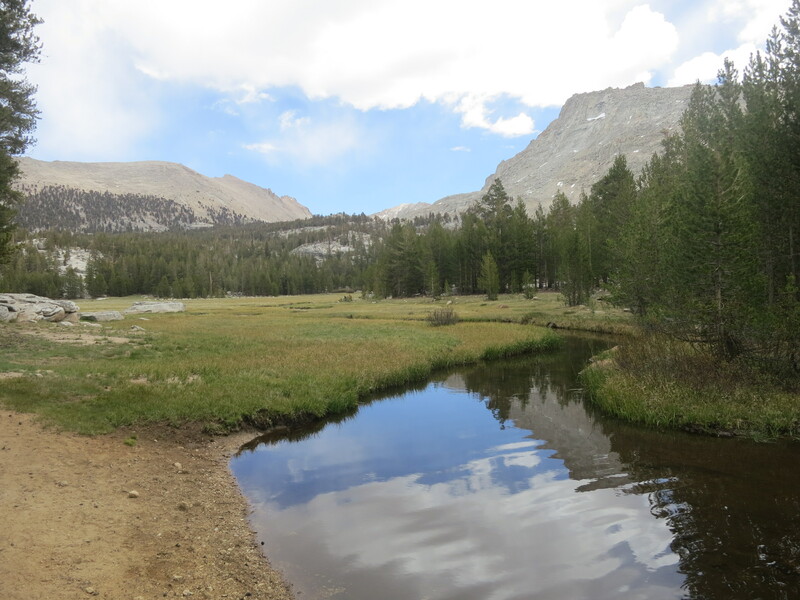 I continued along the path and then turned down along the creek toward the tents. 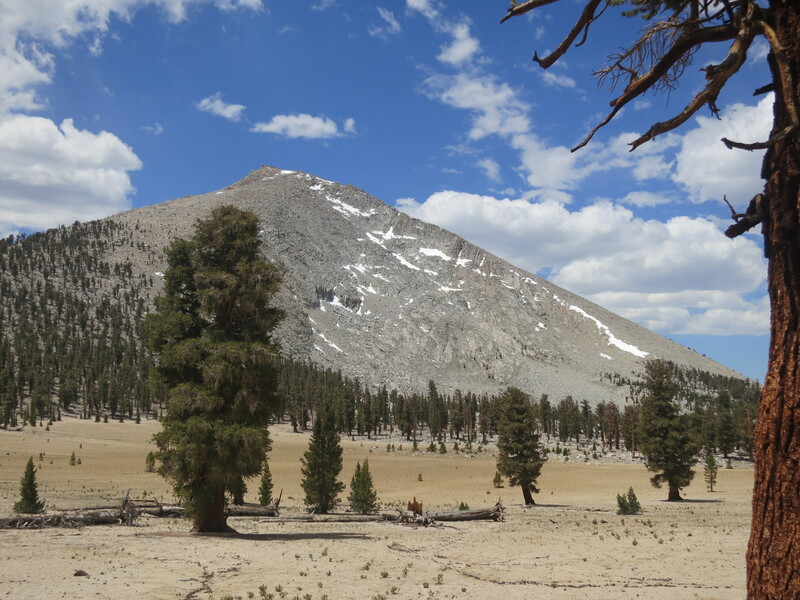 A hiker was walking toward me and said, “Welcome!” when we were in close proximity. How nice! She explained the lay of the land, letting me know that there were signs that said no camping on the grass where the guys were set up, but that there were spaces on the rock. “On the rock?” Yes. She was set up there. She told me to check it out and see what felt best to me. I felt so at home and so appreciative that someone wanted me to do what felt the most comfortable to me. (What a rarity!). 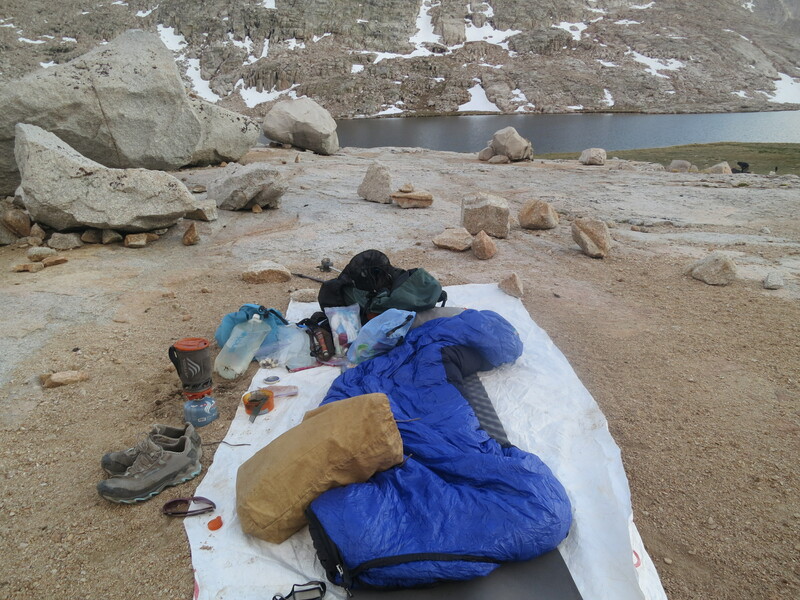 I picked a spot and spread out my piece of Tyvek, unrolled my sleeping pad, and drew my sleeping bag out of its stuff sack. 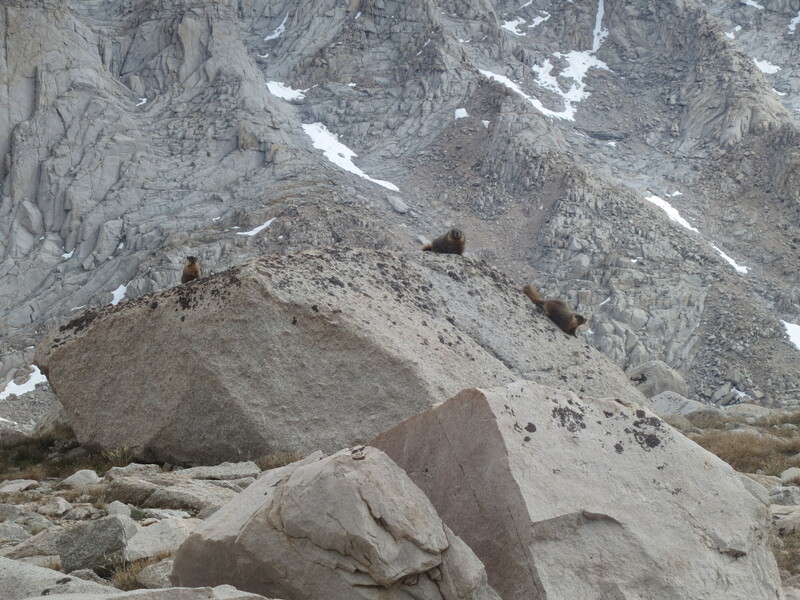 Marmots were running all over the place, investigating any unwatched items. “Do you mind if I join you for a bit?” the girl asked after she returned from collecting water. “No. 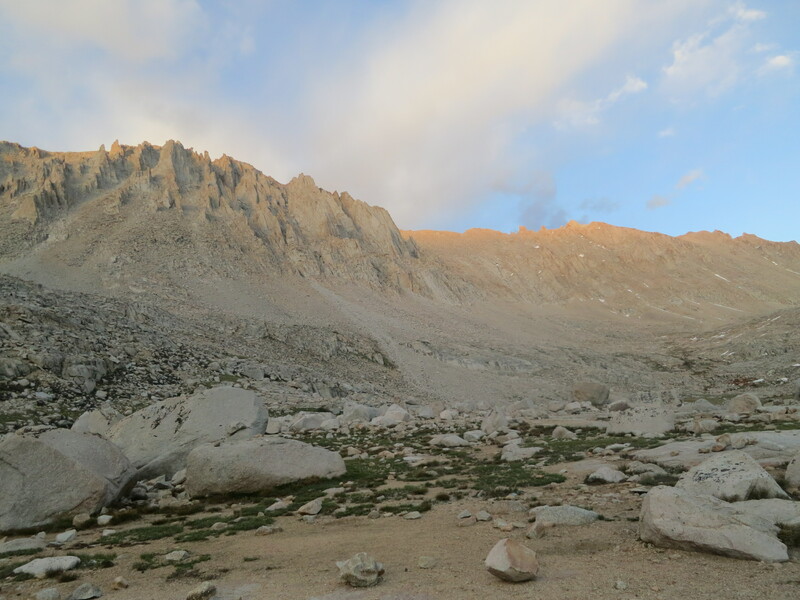 Of course not.” She told me that this was her second night camping here and that she had summitted Whitney yesterday. 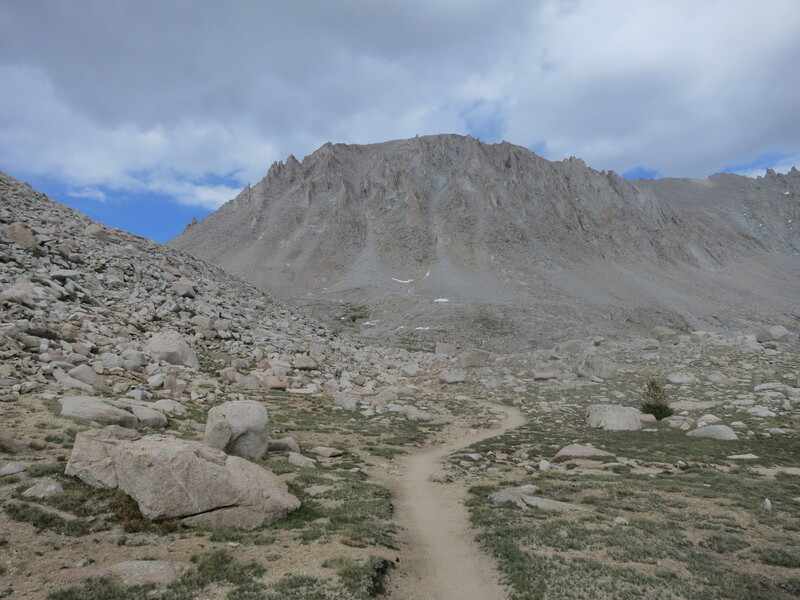 I learned that her name was Dust Bunny and that she had skipped up to the Sierras from Agua Dulce because she wanted to play around and not be constrained by hiking a single path. She also opened up about her recent divorce and former abusive partner, as well as her neglectful father. While I’ve never been even close to being married, it seemed like we shared similar histories and current relationship issues as a result. She talked about how we subconsciously seek out and attract certain types of people in our lives and it was making me upset to realize how much work I still had ahead of me and how unbelievably long it takes to undo patterns imposed on an abused child. As I told her about some of my experiences, I couldn’t help but cry. Things were not looking hopeful to me at all. However, she reminded me that we were out here, actively working on our lives and seeking out something good. “Yeah,” I agreed. “Look at where we are!” How many people sleep in a place like this? 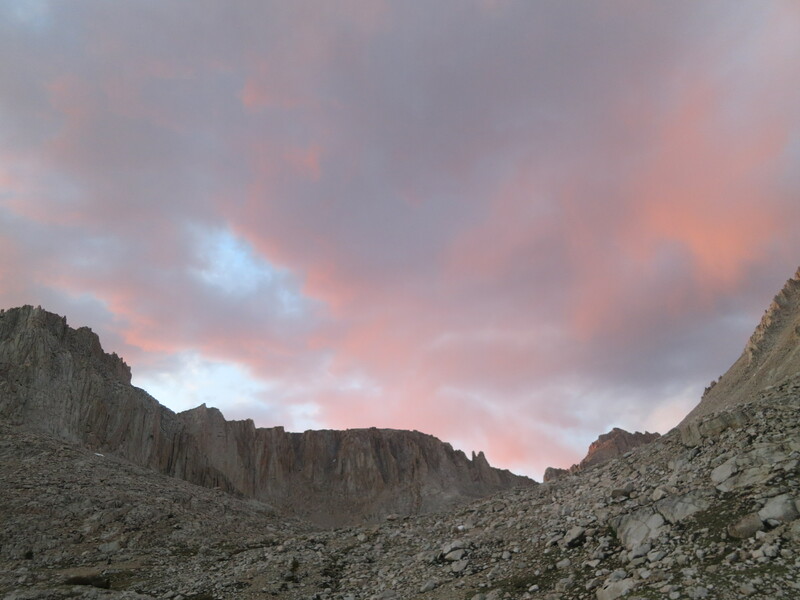 I told Dust Bunny that I had had a reading over the phone before I started the PCT and was told that this hike was about me shedding past emotions and hurts as I walked, as well as creating a heart-space shield around myself that could only be entered by others with open hearts. She said that she felt like I was allowing her right into my heart space and she was so thankful for that. She had only been around guys in the past few days and was hoping for a girl to talk to. And then, I appeared! She said she might climb Whitney with me tomorrow, but she wasn’t sure because the cold air really took it out of her. 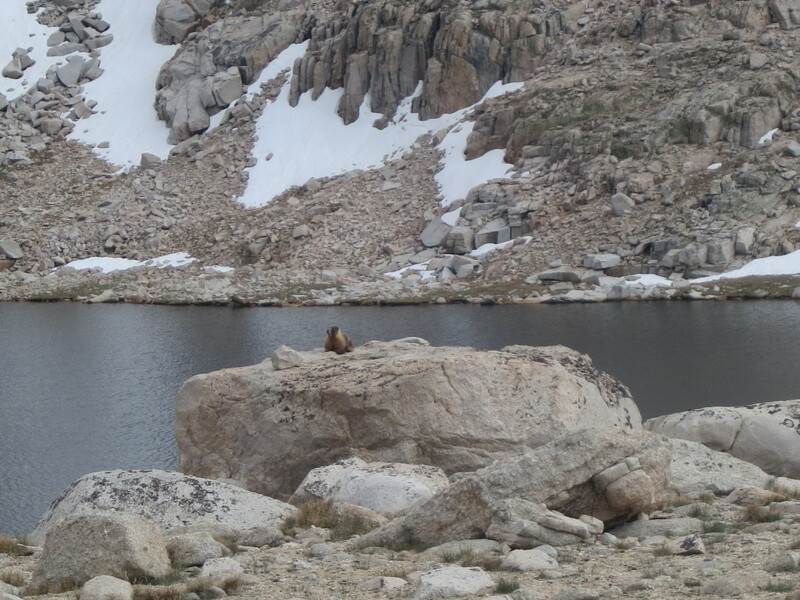 An older man joined us on our rock, but found his own space. My stomach was really hurting and I told her how hard it was to be in a good mood when when I was experiencing such pain. She said she knew what that was like. For years, she had suffered from stomach problems, and had tried lots of different food diets. She found that she couldn’t eat gluten and that maybe I was suffering from something similar. 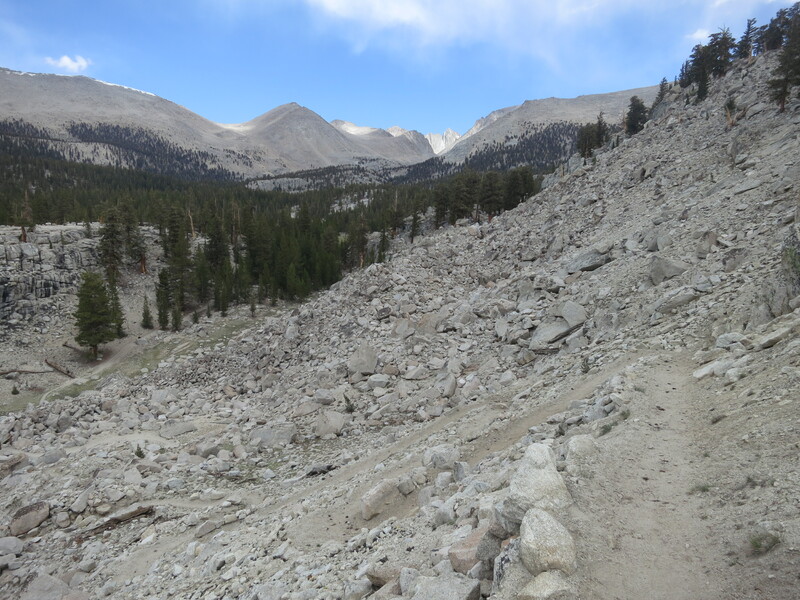 I wondered, why, all of a sudden, on my PCT hike, would I become gluten intolerant. It didn’t make any sense. The air grew colder and the hour got late. I wondered where all the extra time I was supposed to have with this short day went? Dust Bunny returned to her area and said she probably wasn’t going to climb Whitney with me and wanted to know if I would be okay. We both said we hoped we would see each other at some point later on. 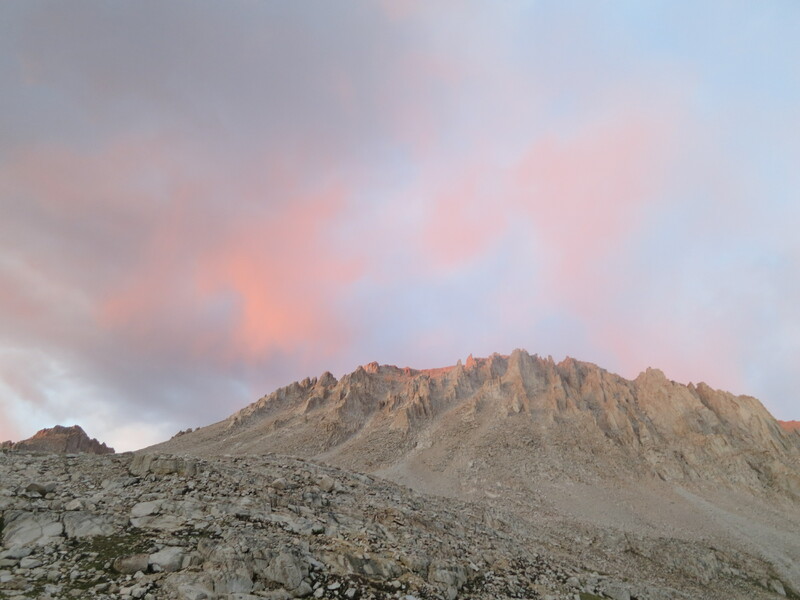 In just a couple of hours, it would be time for me to get up in the dark and start making the climb up the tallest mountain in the lower 48! I hoped I would be able to stay warm enough. 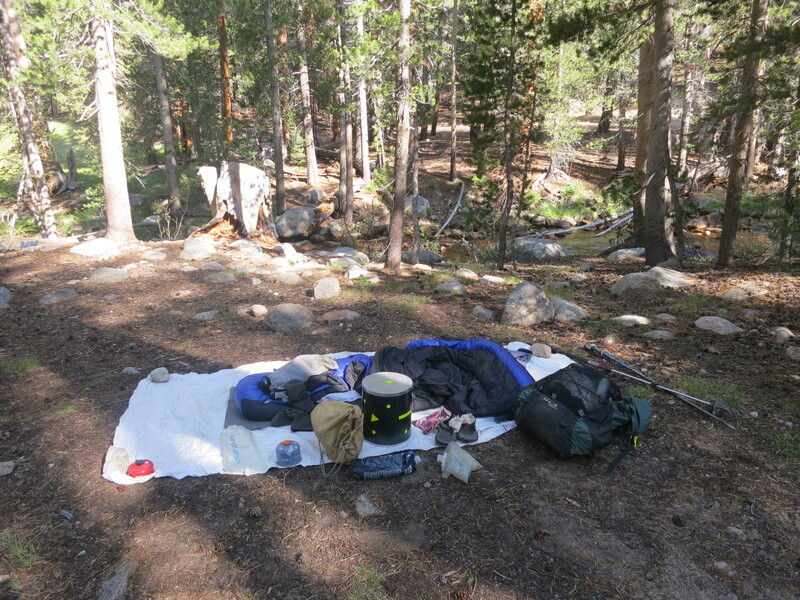 This entry was posted in Uncategorized and tagged Guitar Lake, Pacific Crest, PCT 2013 blog, PCT thru-hike by Wendy. Bookmark the permalink.